The Beyond is without a doubt Fulci’s most famous and appreciated work. A vast number of iconic images are remembered from it : the painter’s hanging, the mysterious symbol, Emily on the deserted Pontchartrain Causeway as well as the forever beautiful final sequence. How did you end up being part of the shooting team of The Beyond? I had just ended up a 20 year career as a TV journalist and feature producer in New Orleans, and was about to create my own video production company, TELEventure, so I was available. That’s when Jo Beth Bolton, The Louisiana State Film Commissioner, called me telling me an Italian production wanted to scout locations in the area. Their problem was that none of them spoke much English. As I am bilingual and know Louisiana real well, she thought I could help. I first met Fabrizio De Angelis, the producer, who was a real gentleman and I then helped Sergio Salvati and Lucio Fulci to find suitable shooting locations. I did all this without ever reading a single line of the script. We got along very well, they liked me and asked if I could work full time on the film in the USA. What job were you actually doing? I became assistant to the producer. I dealt with anything possible and imaginable. I was finding extras, looking after the money coming from Italy, serving as translator with local authorities, and so on. This is all due to the fact that the budget was ridiculously tight… Like any producer worthy of his title, De Angelis was a juggler. I also worked very closely with David Pash, the production director, an amazing guy. What were the different shooting locations? The whole cast and crew had rooms at the International Hotel which was on Canal Street, in the centre of New Orleans. The very nice hotel belonged to the sons of Italian immigrants from Sicily. The new members of the cast who were in town just for a day or two were also stayed there. 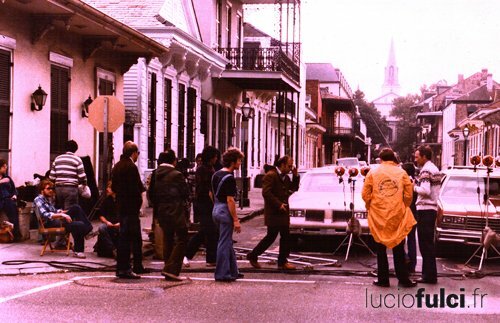 Lots of the exterior shooting, whether day or night, was done in the French Quarter also called “Le Vieux Carré”. We also shot on Orange Street in a historical part of the town for the scene of the boarded-up house as well as on the campus of Dillard University. We used the main administration building with its large columns for the exterior of the hospital where Warbeck drives up and enters. Opposite the French Quarter, we shot in the historical St. Louis Cemetery #1. Because the town and more precisely “Le Vieux Carré” is built on reclaimed land on top of ancient swamps, coffins tend to resurface after heavy rains. So all burials werre done in brick vaults above ground. We recruited the young priest of a nearby catholic church for the burial scene. So the shooting then went to Lake Pontchartrain, near Madisonville in Louisiana, on the grounds of the Fairview Riverside State Park where the historic Otis House is located. This means that the actors and the technical team had to drive more than 77 kms round trip to go to and from work daily from New Orleans. There were four or five vans for transportation. I hired the caterers for the shoot in the town centre and different ones when we were working in the Otis House. We know about the Italian film crew working on the shoot, but what about any American crew? New Orleans independent producer, Joe Catalanotto was hired at the last minute after the film he was about to start working on was abruptly cancelled. It was a low budget horror film originally entitled “The Scream.” We were able to get him and his team which was great for them and also for Fulvia Film. Joe was a legend and owned a huge rental inventory of vans, lights, generators and all other useful gear for the shoot. “Little Joe” was already well established and renowned on the West Coast and New York, not only for his production equipment but also for his work with low cost and small production teams. He was a man full of energy and always busy. The Italians loved him as he was from Italian origin and had a great sense of humour on top of being a consummate professional. He knew how to find electrical power anywhere even sometimes under very dangerous conditions. I imagine that you didn’t know Lucio Fulci before working on The Beyond. What was your relationship with him like? You are right, I didn’t know him. I have to say that I had really good moments with him. Nevertheless he was quite mysterious, moody. He sometimes yelled during the shoot but he knew how far he could push it as he knew his crew and actors real well. They had done several movies together. Fulci needed to mark his territory. I remember that while setting up for the scene in the old boarded-up house he had a tantrum because he wanted some ice cream We sent somebody to buy him some. The lights were set, the actors ready but Fulci refused to shoot until he had his ice cream. The makeup was starting to run in the steamy New Orleans heat.. His ice cream finally arrived and he ultimately blamed the errand boy for the delay. In fact, Fulci was like a child, he loved to shout non stop “Action ! Action !” and when an idea popped into his mind he would say “Hey, let’s try this”. On the Art level, how was it going? The early concept script outline was only three pages with a story quite different from the one of the final movie. Fulci was always finding new ideas. Let me give you an example. 100 m from the Otis House that we used as the exterior of the Hotel of the story there was a long and narrow lake. We had been given the authorisation to shoot the exterior as well as interior of this historic house. Lucio Fulci or Sergio Salvati had the idea to use the lake for the scene with the boats loaded with the angry mob with torches. This produced beautiful reflections on the water and smoke machines provided the perfect atmosphere. In the end, lots of these scenes were dreamed up on the spot and added as a combined work between Fulci, David Pash and the crew. So this sequence was shot in the US? Yes, and half of many of the scenes shot here and match-scenes were later shot on sets in Rome. I found extras to play the villagers. David Pash played the leader of the gang who has a torch in his hand and leads the mob into the hotel and up the stairs. 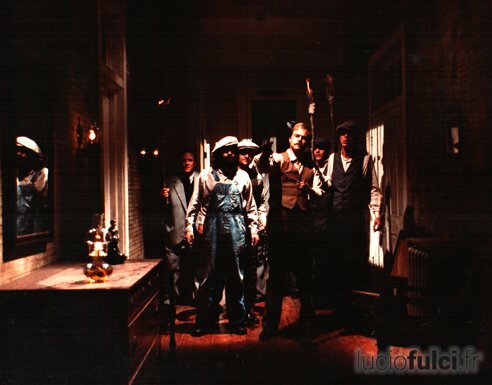 The scenes of the mob rushing inside, up the stairs and and up to the point where they start to enter the door to attack the painter to torture him, is all shot in American. Then the rest of the scene where they come bursting into the room was shot in Italy with different actors of similar build wearing the same costumes. The action is seamless. The old fearful, sweating black man who is hotel receptionist who watches helplessly as the mob enters the hotel was named Johnny Burton I think. He lived in a small house of the road leading to the park. That’s when we spotted his beat up old work truck. We rented it from him for the scene where the plumber drives up in front of the hotel with his toolbox. I think David Pash had the idea to have Johnny play this small part. For your information, the several old cars which arrive in front of the hotel were the same cars used in Pretty Baby (1978) from Louis Malle. David Pash plays the leader of the villagers come to lynch the accursed painter. But the house that was transformed in a hotel for the movie was not that dilapidated, was it? Otis House is a historical home with a superb wooden floors and priceless original furnishings. The Italians wanted to make it look older. In order to do so they sprayed it with water with dark dye in it. They were still reasonable at that stage with their set modifications to “age” the house. But for an unknown reason, they threw cement and sand on the floors which scratched and damaged them. And I was responsible to the State Park officials because I had helped get permission for them to use it. This house belongs to the State of Louisiana. They went nuts when they discovered the state in which the Italians left the house. Then Fabrizio ended up giving me money to pay for the clean up and the restoration of the place. Exactly. In fact, everyday, as I already explained, the cast and crew used this bridge to go back and forth from New Orleans to the shooting location. The 77 km daily round trips across bridge must have given Fulci the idea to shoot a scene there. Closing down both lanes of the busy bridge would have been impossible, even for two hours but that is what Fulci wanted to do. I went to the commission in charge of after the bridge with Fulci of course and I think there was Salvati, De Angelis as well as Cinzia Monreale (the actress playing the blind girl). Fulci’s English was “approximate » so I spoke for all of them. I presented the film as an important production being shot by the Italian Hitchcock in which the Pontchartrain Causeway was going to be a main and important scene. I already knew one of the commission members, Bobby Ragsdale. He liked my many years of TV reporting and features on the CBS affiliate on where I worked. This helped us to get permission to close one of the two parallel bridges .. for a little more than two hours! We managed to shoot all the scenes we needed on time. 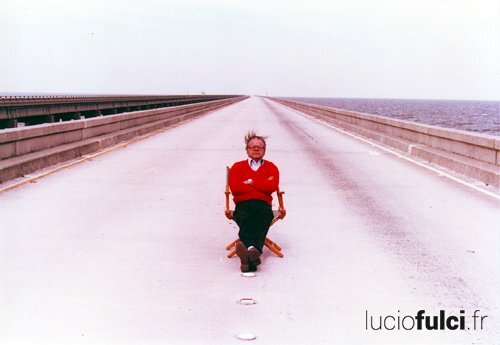 Just before we wrapped, Fulci asked for his Director’s chair to be placed right in the middle of the totally empty bridge that stretched back to the horizon. Fulci sat in it and had a number of color still photos taken, then the causeway was allowed to reopen to waiting traffic! 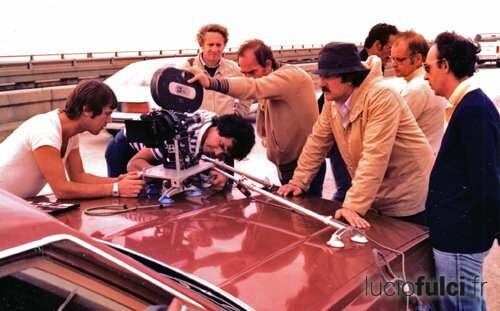 Lucio Fulci (right, wearing a light-colored sweater) oversees the staging of a shot on the Pontchartrain Causeway. Was shooting with the dog difficult? No. The hardest was to find a German shepherd identical to the one chosen for the scenes shot in Italy. The dog in the scenes shot in America was named Max. He was trained to sniff out explosives and belonged to the Jefferson Parish’s Sheriff. He was incredibly calm despite the whole distraction and noise of the shooting and got on really well with Cinzia Monreale. But what was in Fulci’s mind in filming that scene? When you are on this bridge, you do not see the end of it. I think that for Fulci, this causeway in the middle of water went off symbolically into the Beyond. 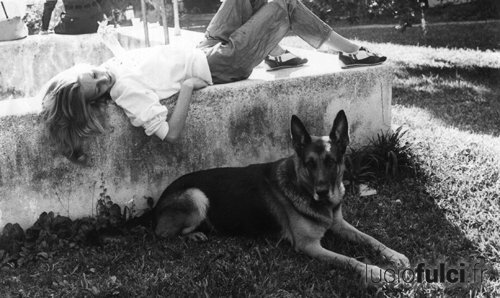 A cigarette break for Cinzia Monreale under the protection of Max, the German Sheperd. So, you ended up getting the Pontchartrain Causeway shut down. But how did you manage to make the French Quarter appear to be deserted? It cost us a lot in cold, ready cash. We hired a Police detail to block off and close the two main streets through the neighbourhood we were using in order to have one street for the technical side and electrical generator trucks and the rest for the shooting itself. We had to go door to door ahead of time to explain what we were doing. In the beginning some of the residents weren’t interested and told us to “go away’. But they eventually came around when we offered them cash in hand. We had to use persuasion and psychology. How did you end up playing the painter Larry? Hahanah ! It was very simple. After working with them for a while, one day, they came to and asked me if I wanted to be in a little scene – David knew that I had acted for years in a theatrical troupe and had done small parts in movies. 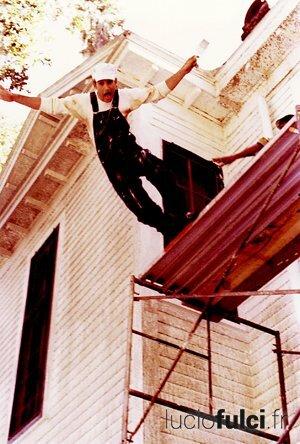 I learned, “the little scene” involved my falling from an 8 meter scaffolding platform into a ‘bust bag’ which is used for stunt falls. It is a large bag that rapidly deflates when you land on it. But you have to land in on the “X” in the middle of it ! But the hardest was shooting the cut-in s”hot in which I actually hit the ground. I had to jump from the third step of a ladder for several takes, biting a blood capsule at just the right time so the “blood” would run out of the corner of my mouth. I am also in the scene with the spiders. There were some real ones mixed in it as with some electrically operated very realistic looking fake ones. When Michele Mirabella, the guy who plays the architect , saw the real ones coming out of their boxes, he categorically refused to shoot the close ups and refused to be near them. Then I was asked : “ Hey Larry, are you afraid of spiders ?”. I said that I was not and Maurizio Trani, this wonderful make up artist, applied this fake three days beard on me. That’s how it happened. I had lots of fun shooting that scene in which is cropped from my nose down to my chest with spiders crawling up to on my chin. Incidentally, there were special spider ‘handlers’ who were able to make the live tarantulas turn right or left as they crawled up toward my face by blowing on them through long straws just out of camera range. Larry Ray during his stunt. But wasn’t this scene shot in Italy? Yes, yes. After the shooting in the US, I went to Italy for two weeks and visited the Italian shoot. It was in the Biblioteca della Società Geografica Italiana in January I think. It was very cold in there and they had to use the hot lights held right over the cold marble floors to warm them up enough so the spiders would crawl over them. You are credited under the following name : Anthony Flees. Why this pseudonym? I had nothing to do with it. I think the credit names were just made up (except for the principal actors) after L’Aldila was sold at MIFED, you know the international film market in Milan. They needed names and if didn’t know the actor’s actual names in the smaller parts they just made them up. Before Anthony Flees, in earlier VHS releases they used another made up name, Eric Farber for the role of Larry! There was no regulation or control for proper listing of cast names at all for those kinds of movies. How did Lucio Fulci direct the English speaking actors as his own command of the language was at best limited? How did shooting go with David Warbeck and Catriona Mac Coll? They were consummate professionals, so there were few problems and they never complained. We all had a good time despite a very tight schedule. 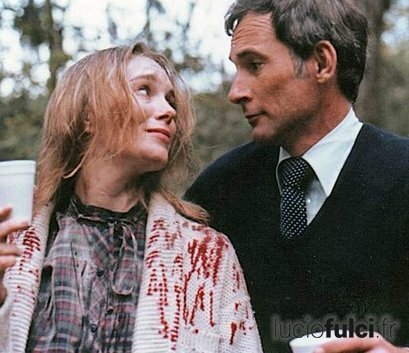 As for the US shooting, I was never aware of friction or problems between the actors or with Fulci. David Warbeck loved New Orleans and enjoyed his free nights exploring and partying in the French Quarter. Catriona MacColl and Larry Ray, relaxing while waiting for their next scene. You said that many scenes were found/created during the production. 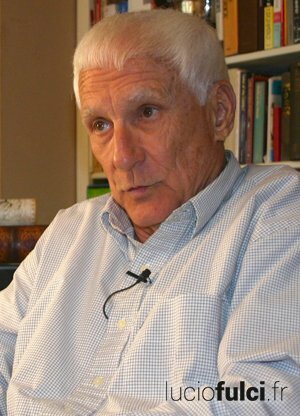 Was the screenwriter Dardano Sacchetti present during the shooting for the rewritings? No, I have no recollection of this person. Apart from his name being credited for the brief script outline, I do not remember his being his involved in production. At least for during US shooting. The photographs in this interview are from Larry Ray’s personal collection.